Generally, sunlit objects are far brighter than any stars. 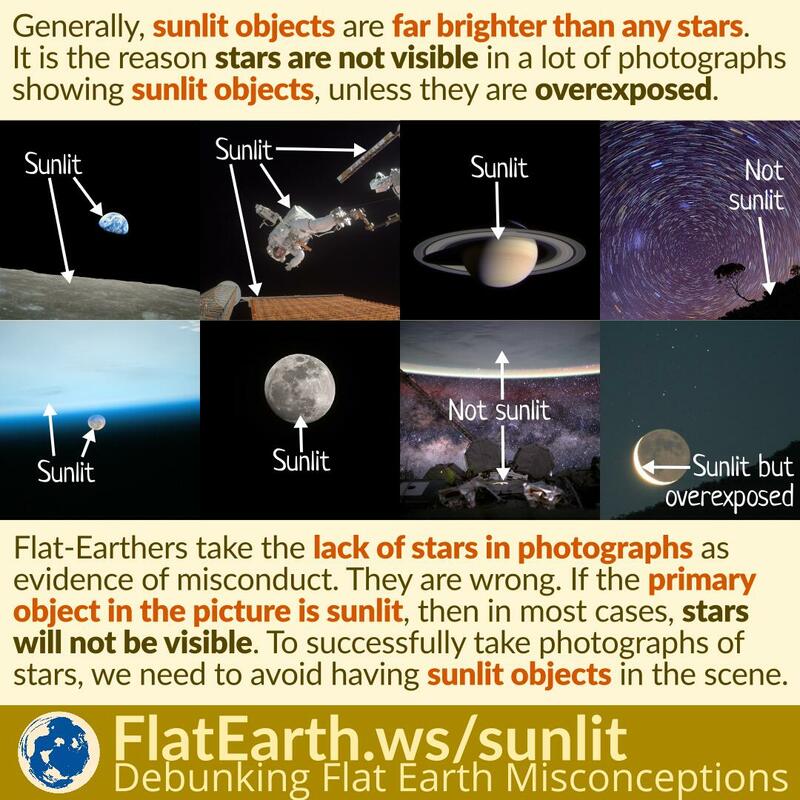 It is the reason stars are not visible in a lot of photographs showing sunlit objects unless the objects are overexposed and made much brighter than the correct exposure. Flat-Earthers take the lack of stars in photographs as evidence of misconduct. They are wrong. If the primary object in the picture is sunlit, then in most cases, stars will not be visible. On Earth, daylight sky is glowing in bright blue due to Rayleigh scattering. 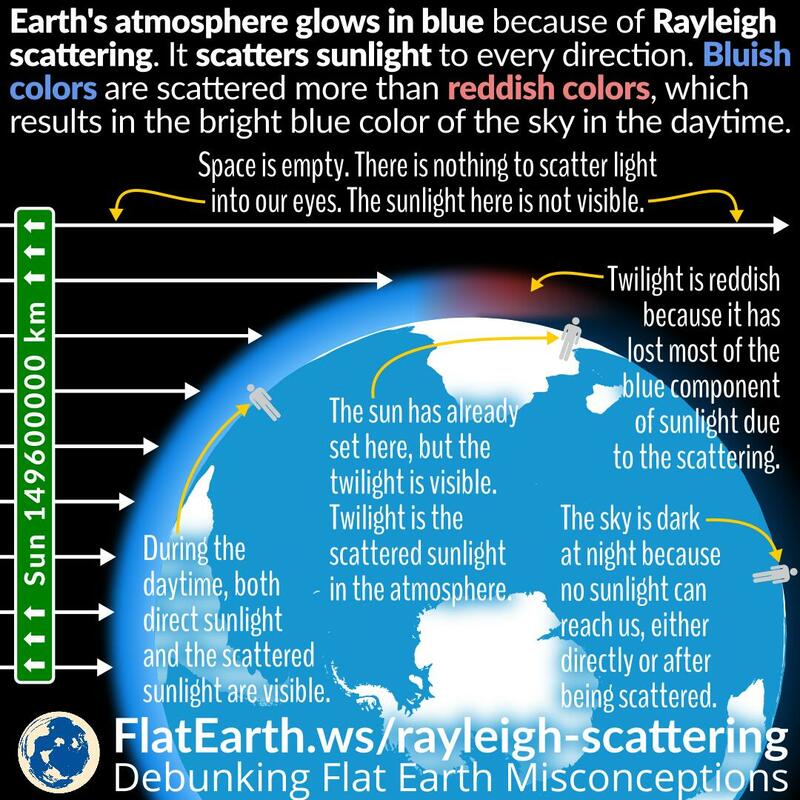 Sunlight is scattered in every direction by the oxygen and nitrogen molecules in Earth’s atmosphere. Such the phenomenon does not happen on the Moon, causing the dark sky of the Moon. 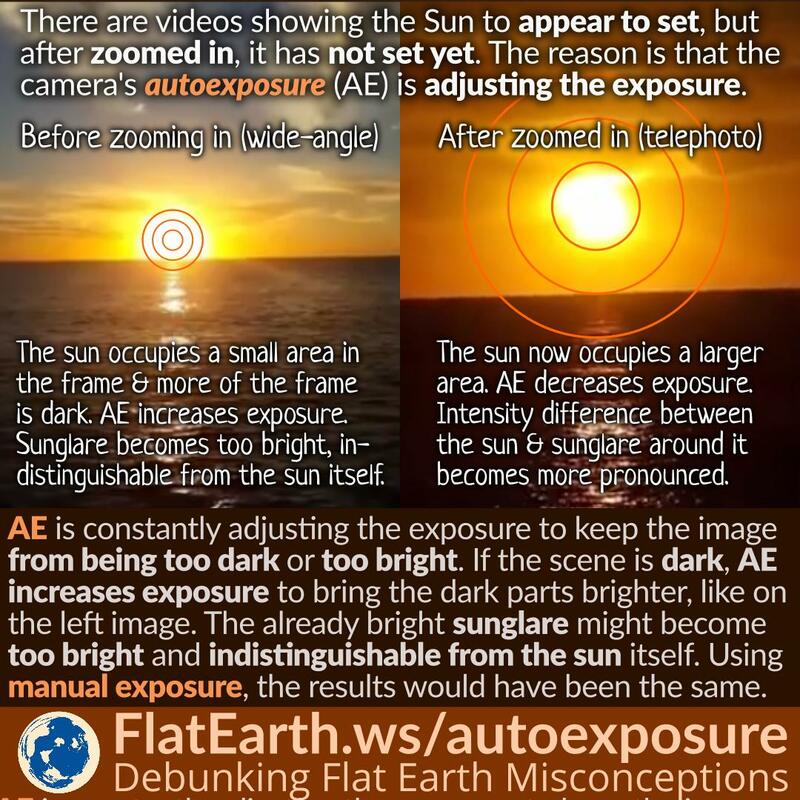 Flat-Earthers claim that the dark sky of the Moon captured by photos and videos taken from the Moon are “proof” there is misconduct. They are wrong. 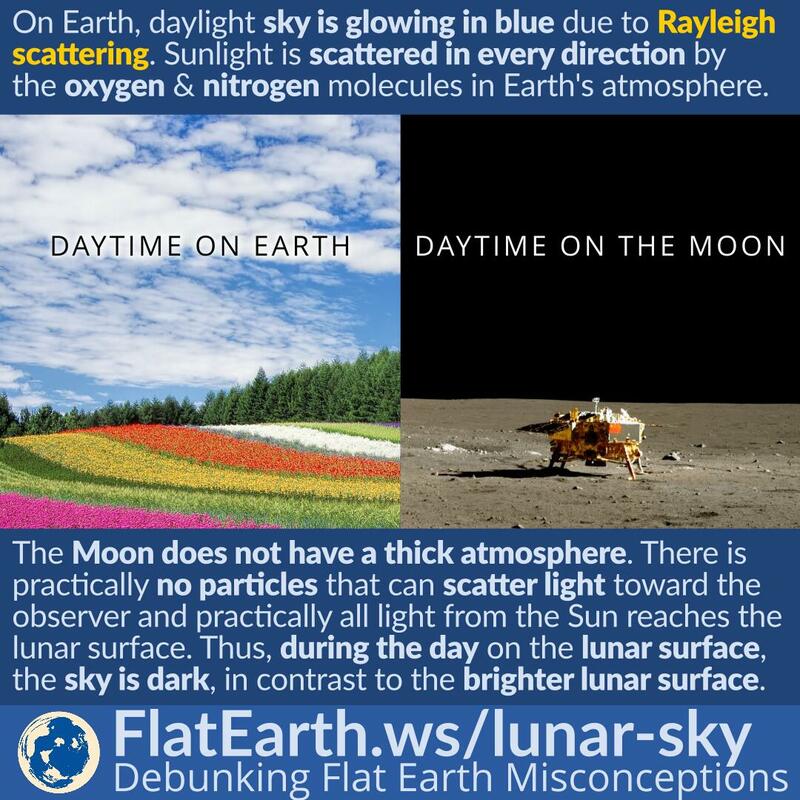 Just because Earth’s sky is bright blue, it does not mean it will be like that on the Moon and other planets. Some flat-Earthers like to observe celestial phenomena and the positions of celestial objects. Sometimes, they insist such events cannot possibly happen if the Earth is a sphere orbiting the Sun, and took the wrong conclusion that the Earth must be flat. We can try asking them the time of the occurrence and the position of the observer, then use Stellarium or similar applications to simulate it. If the result matches the observation, then they have nothing to complain about. Their confusion was only the result of their ignorance. The Sun emits sunrays to every direction. But as the Sun is very far, the sun rays that reach us are practically parallel. To an observer on Earth, the rays of light coming from the Sun form a maximum angle of about 0.53°. They are practically parallel, but not perfectly parallel. 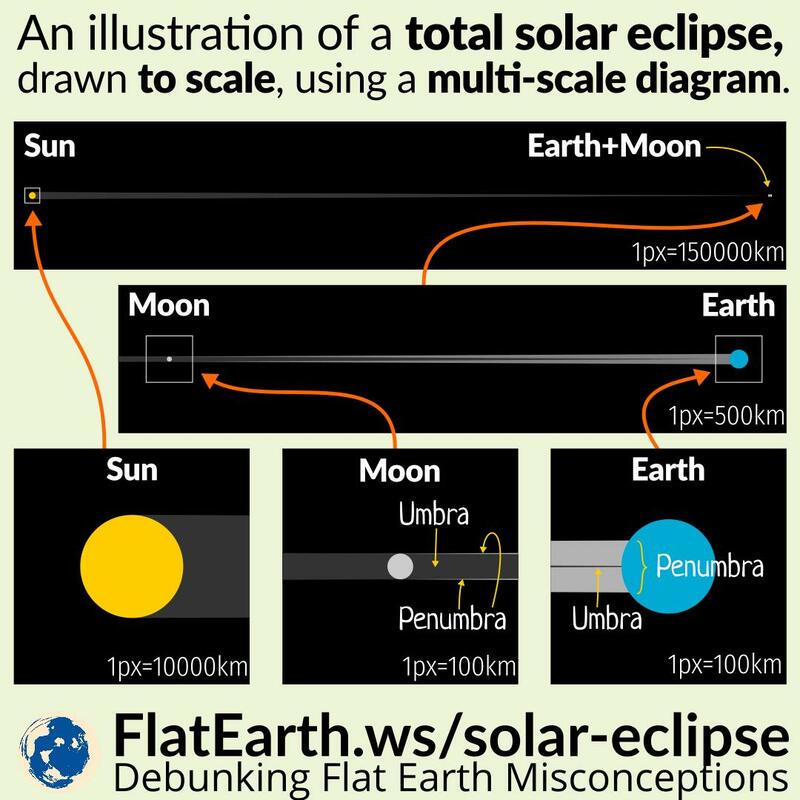 Flat-Earthers often question the fact we say sun rays are parallel, but in any diagram of an eclipse, they are drawn at an angle. They merely confuse practicality with perfection. Sunrays are practically parallel, but they are not perfectly parallel. Sunspots are darker spots on the surface of the Sun. The location where sunspots appear is unpredictable, but the appearance of sunspots is always the same when observed from anywhere on Earth; only the orientation is different on different observer location. Observers on the opposite position on the Earth will see the sunspots reversed. 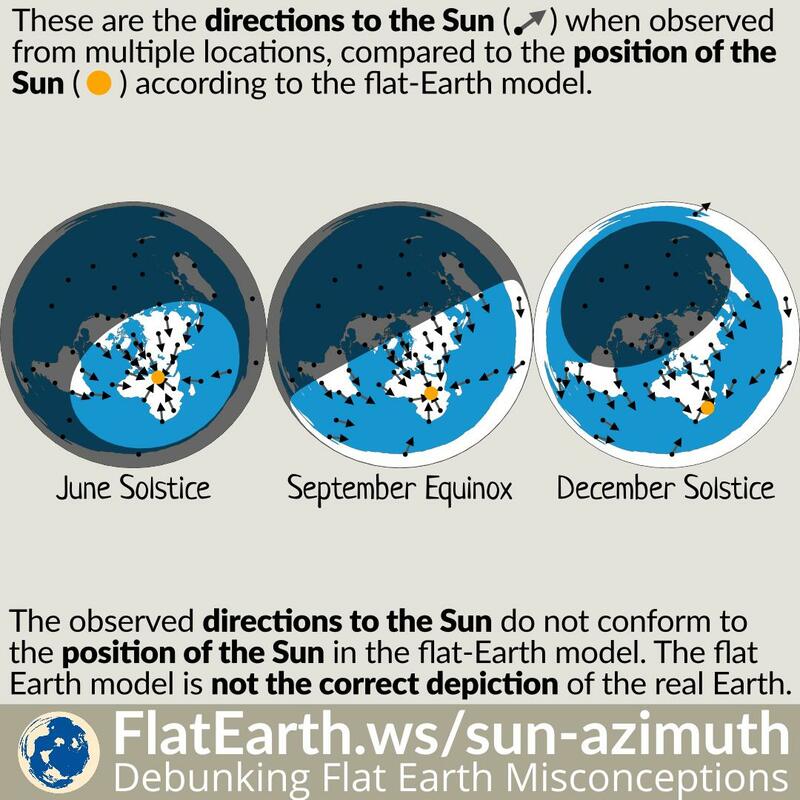 The reason is that the Earth is a sphere. Any two observers on Earth’s surface are not standing on the same plane. 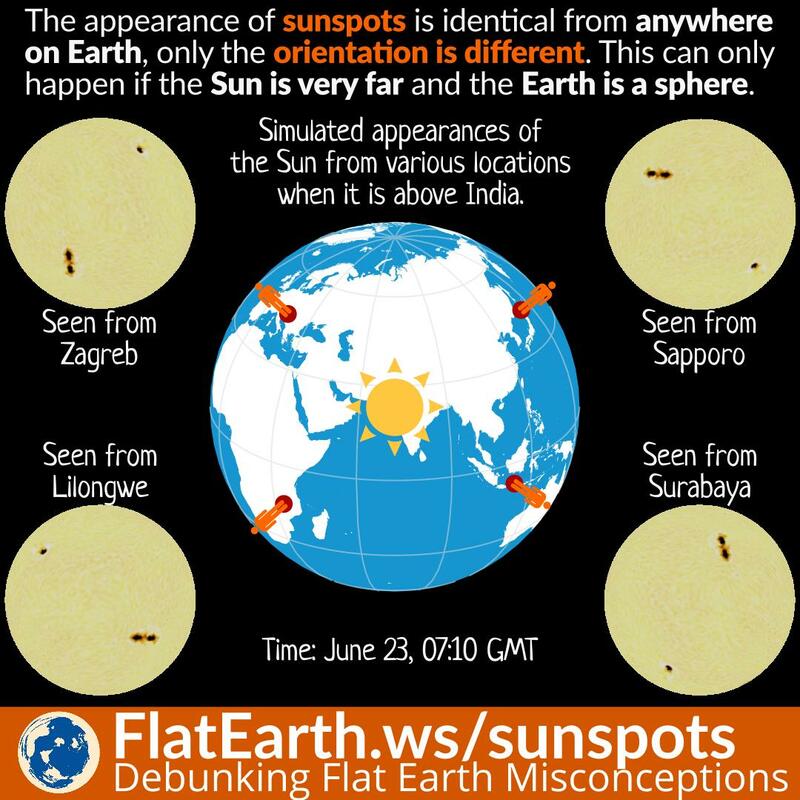 Some flat-Earthers have spatial awareness difficulties and present the difference of the appearance of sunspots as ‘evidence’ the Earth is not spherical. They are wrong. If the Sun were close as in the flat Earth model, we would see the different appearance of sunspots on the different observer location. In reality, everyone on Earth observes the same appearance of sunspots, only with the different orientation that corresponds to the position of the observer. 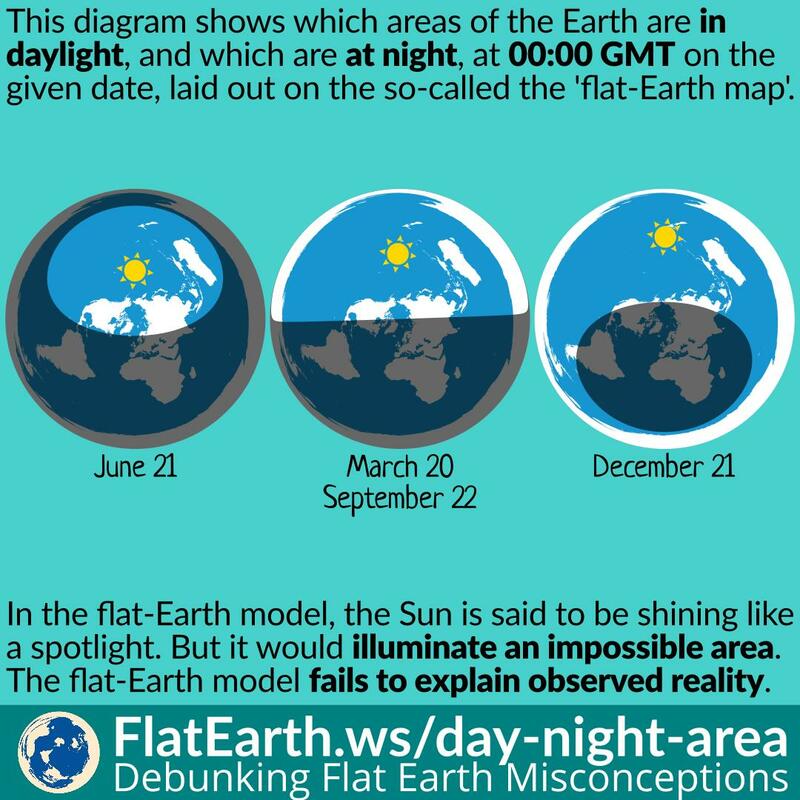 Some people are confused that a full moon is visible all night, and think if the full moon is the result of the opposition of the moon from the sun, then a full moon should be visible only at midnight. Flat-Earthers who have such spatial visualization problem take a step further and use it as ‘evidence’ that the Earth is not a sphere. They are wrong. 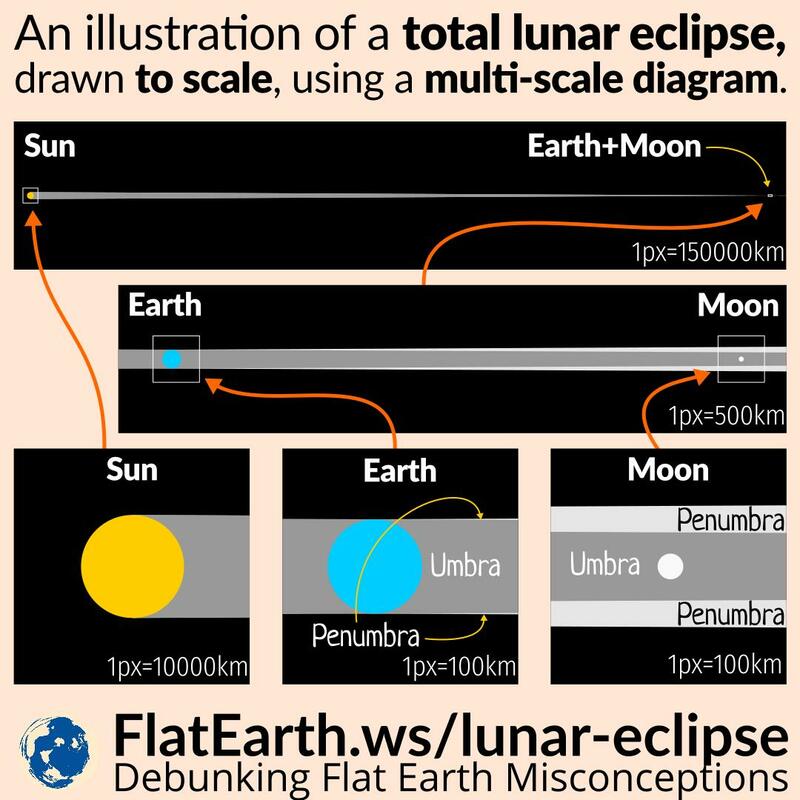 The full moon phenomenon can easily be explained in the spherical Earth model. During an equinox (March 20 and September 22-23), the Sun is directly above the equator. 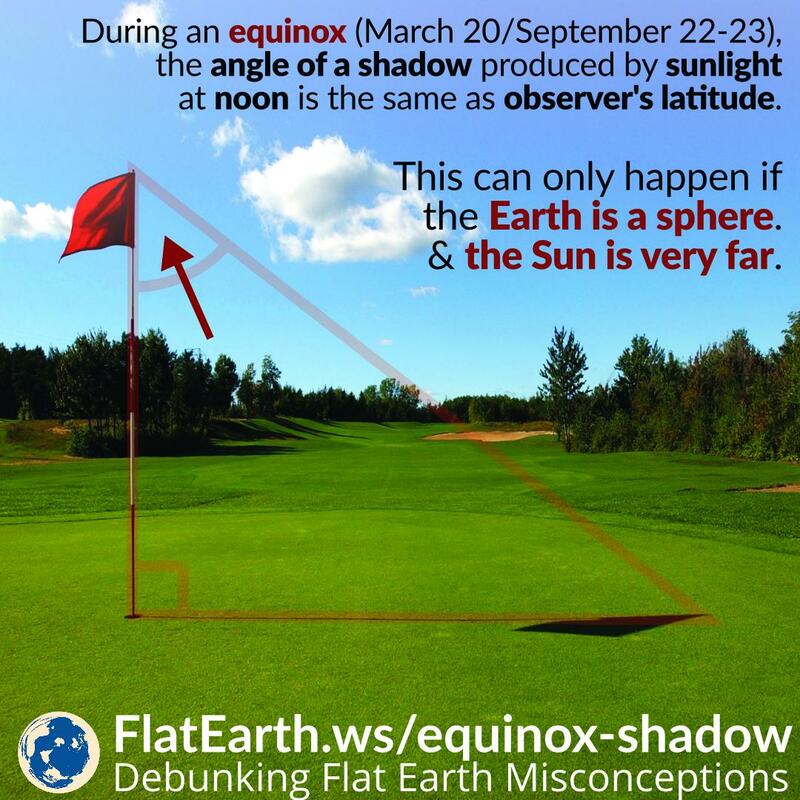 If we are on the equator, an upright stick will not have a shadow in the middle of the day. On any other location, the angle between the stick and the direction of sunlight will be the same as the observer’s latitude. This fact can only occur if the Earth is a sphere, and only if the Sun is very far relative to the size of the Earth. The variation of the temperature at the different times during the day is the result of two primary causes: the difference of the thickness of the atmosphere the sunlight must traverse to reach the surface; and the change of the concentration of sunlight over the same surface area of the Earth. 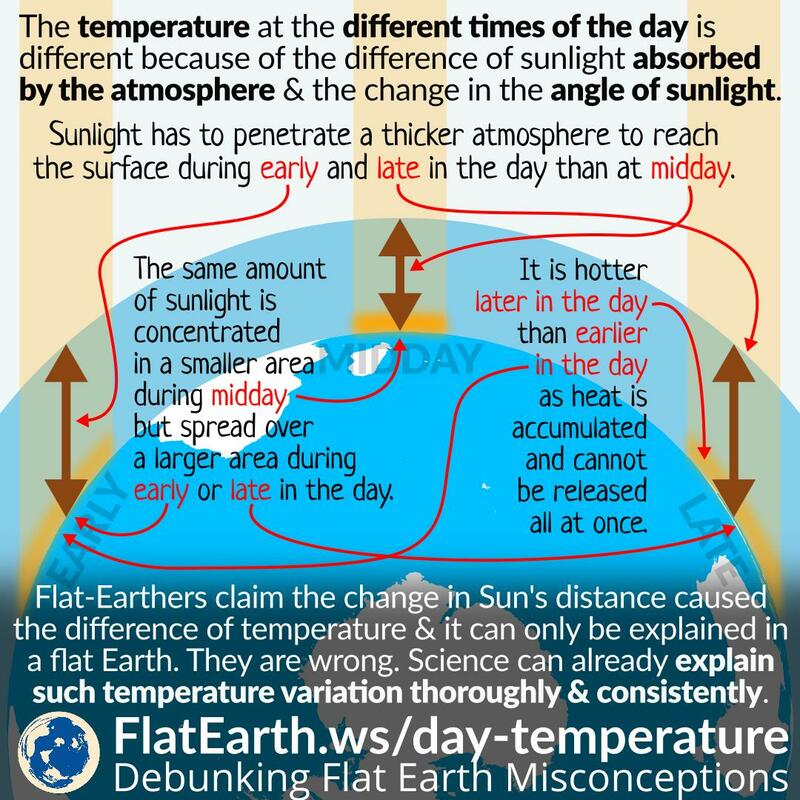 Flat-Earthers claim that the change in Sun’s distance caused such a difference in temperature and that it can only be explained in a flat Earth. They are wrong. NASA explained the Saros in a web page titled Eclipses and the Saros, and the unscrupulous flat-Earthers were quick to devise a conspiracy theory. They invented the scenario that NASA —a space agency with billions of dollars of a budget— are somehow using ancient technology to predict the occurrences of an eclipse. They are wrong. NASA does not use the Saros Cycle to predict eclipses. 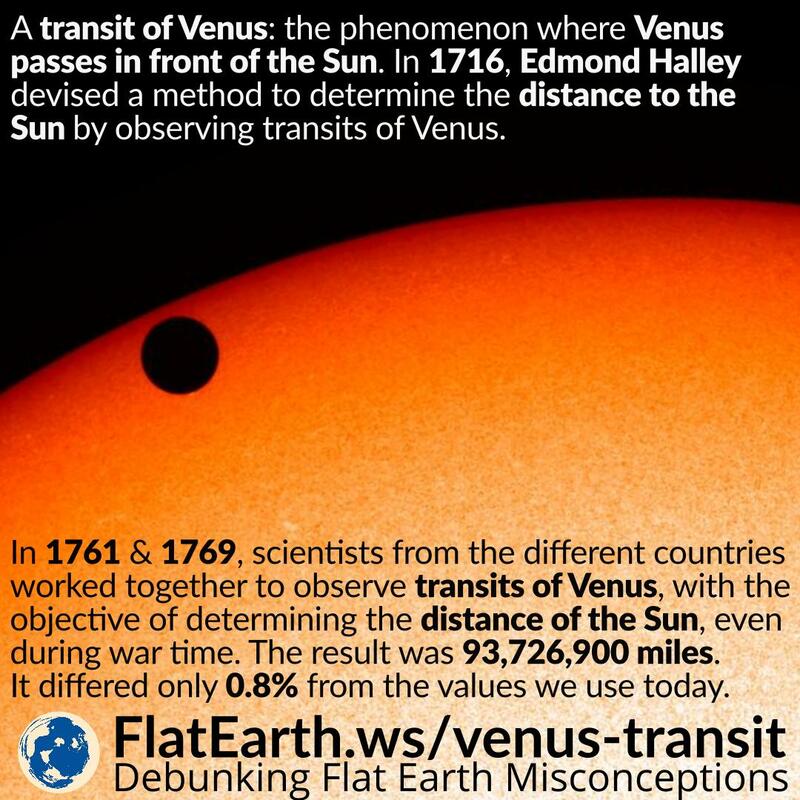 The distance to the Sun was first determined with a good accuracy from worldwide observations of the transit of Venus. A transit of Venus is a phenomenon where Venus passes in front of the Sun. By measuring the time Venus spends crossing in front of the Sun from two or more locations on the surface of the Earth, it is possible to calculate the distance to the Sun. 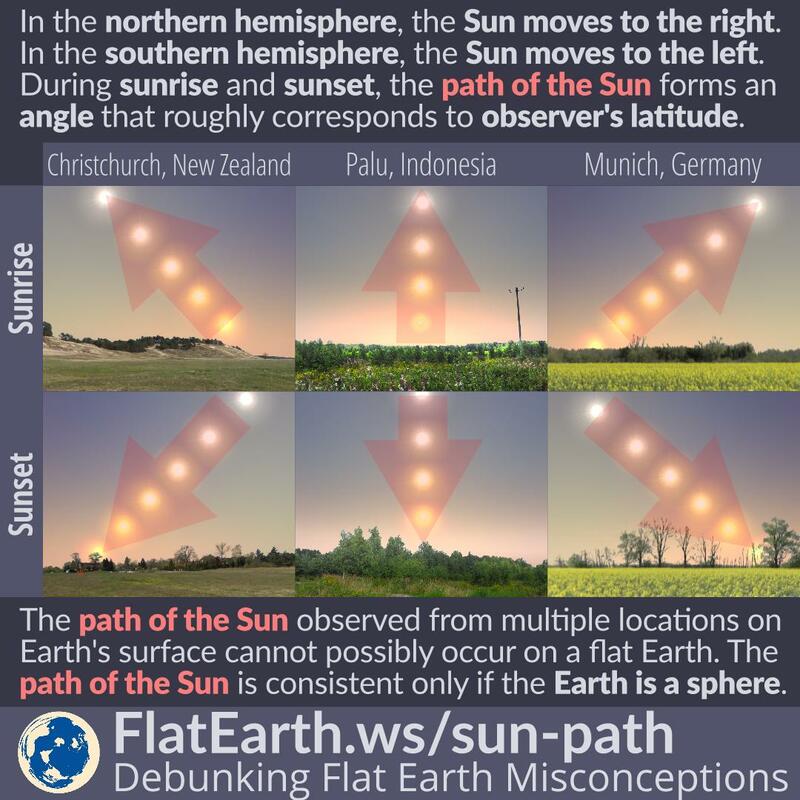 Flat-Earthers insist that it is impossible to determine the distance to the Sun in the globe model because sun rays are practically parallel. They are wrong. Using simple geometry, the distance to the Sun can be determined from the observations of the transit of Venus. At any given time, there is an equal area of the Earth that is experiencing daytime, and that is having a night time. The reason is that the sun is very far, and it would illuminate a hemisphere of the Earth, and leave the other dark. If we plot which areas of the Earth that are getting sunlight on an azimuthal equidistant map centered on the north pole, the sun would appear to illuminate a somewhat elliptical area during the northern hemisphere summer, and a lopsided Bat-Signal shaped area during the winter. During the equinox, the sun would appear to illuminate a half-circle area. The apparent size of the Sun is practically constant throughout the day. This can only happen if the Sun is practically at the same distance all day. In the flat-Earth model, the Sun is close to the surface at the distance of about 5000 km (3500 miles). The Sun is supposed to be moving in a circle, and it completes the circling motion once in a day. This fact should cause the Sun’s apparent size to change during the day. But it does not happen. 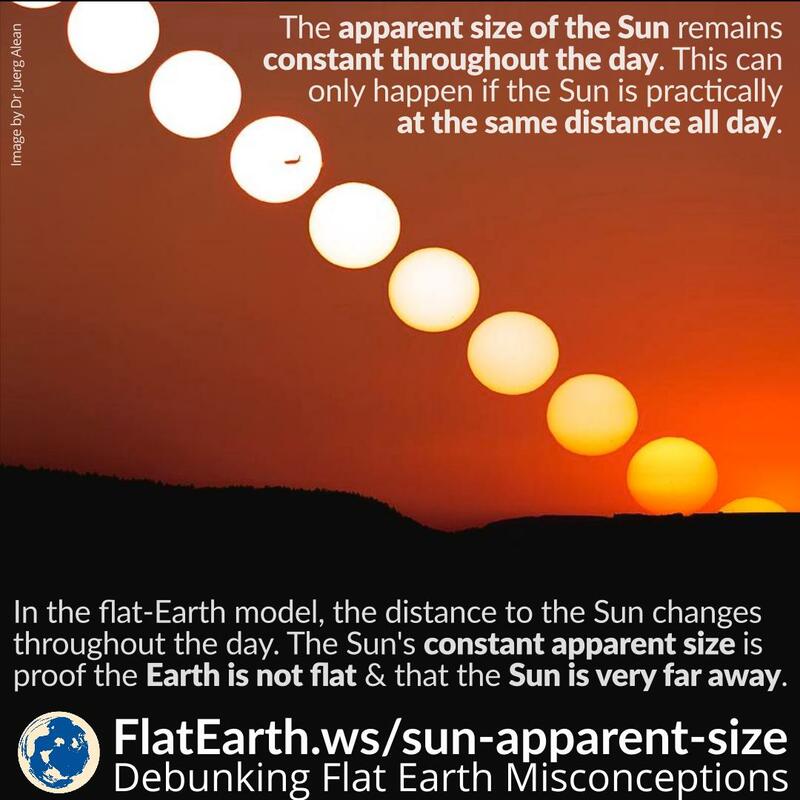 The Sun’s constant apparent size is evidence that the flat-Earth model is wrong, and that the Sun is very far away. Flat-Earthers often bring Galileo into the discussion. They treat him as a ‘villain’ who supported the spherical Earth but unable to prove it as he failed to demonstrate the occurrence of stellar parallax. They are wrong. 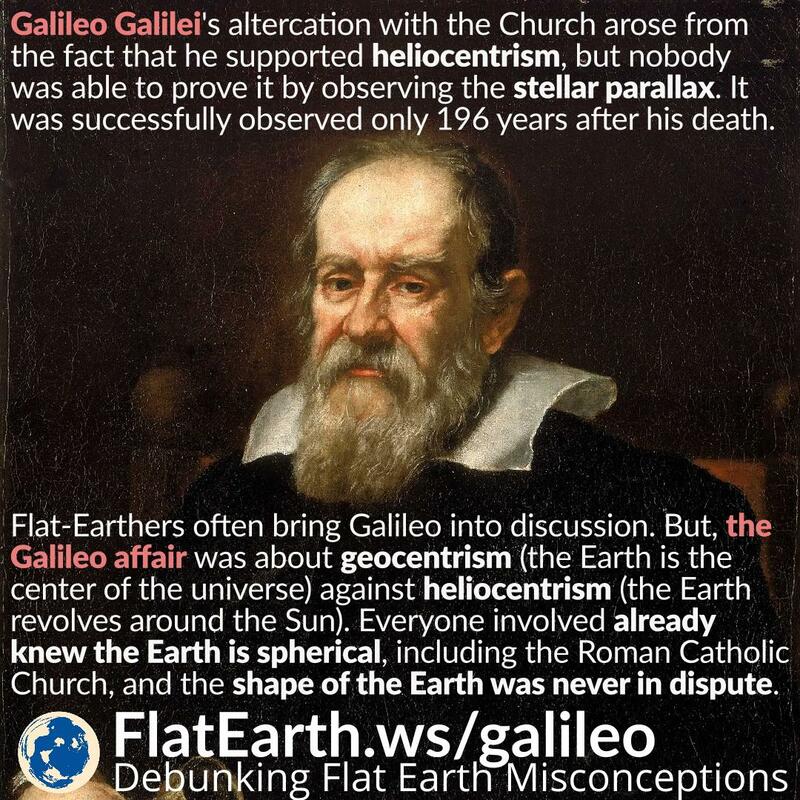 The Galileo affair was in fact not about the shape of the Earth at all. It was about geocentrism vs. heliocentrism. Everyone involved already knew that the Earth is spherical.